In 2013 the NYC band released their fifth album ‘Comeback Machine’ but did not tour it. Prior to the two shows they are done in the past two weeks, The Strokes had not plated live since Brazil on November 5, 2011. The shows marked the live debut for the two of the three ‘Comeback Machine’ songs although Albert Hammond Jr was including ‘One Way Trigger’ in his solo shows earlier in May. The Strokes played a low-key gig at Port Chester in New York on May 31 and then performed a full set for the Governors Ball on Randall’s Island on Saturday night (June 7, 2014). The band played at 6:45pm, before headliner Jack White. Albert Hammond Jr has debuted the video for his new song ‘Set To Attack’. Albert Hammond Jr has shared his new song ‘Muted Beatings’ to preview his upcoming fourth solo album ‘Francis Trouble’. It seems that Ryan Adams might be having a bit of a hissy fit towards the Strokes. This week on Beats 1, Julian Casablancas from The Strokes spoke to Zane Lowe on new material, Cult Records, Eps v albums and festivals. 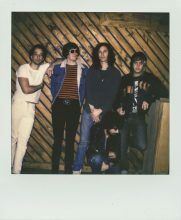 The Strokes will deliver new music next week with a new four track EP ‘Future Present Past’ on the way.